Industrial design registration is an important part of intellectual property, which is also an inevitable trend of developing countries like Vietnam. 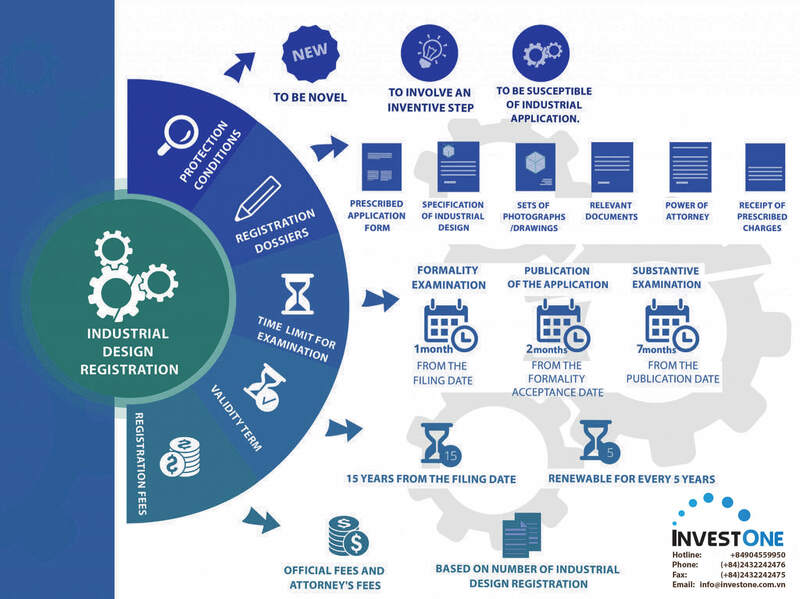 However, registration procedures for industrial design protection are more complicated than trademark registration, so it is difficult for enterprises to self-implement, but must rely on the support of law firms such as InvestOne. Circular No. 01/2007/TT-BKHCN of February 14,2007 guiding the implementation of the Government’s Decree No. 103/2006/ND-CP; supplemented and amended on Circular No. 13/2010/TT-BKHCN of July 30, 2010 and Circular No. 18/2011/TT-BKHCN of July 22, 2011. Circular No. 263/2016/TT-BTC of November 14, 2016 stipulating the rates, collection, remittance, management and use of intellectual property charges and fees. Industrial design is the outside appearance of the product represented by shapes, lines, colors or combinations of these elements. Power of Attorney (following our form). Substantive examination within around 07 months from the application date. Representing clients in filing industrial design application in foreign countries.